Dental crowns are great at what they do – giving us the wonderful benefits of functionality and aesthetics. A crown fully encases a tooth, covering its flaws and giving it structural support and protection from damage. In fact, Dental crowns are among the most common procedures performed by dentists worldwide because of their versatility. They not only restore your teeth, but your smile as well. As long lasting and durable dental crowns can be, there are actually cases where a crown breaks and fails to do its purpose. Therefore, trusted dentist in Maryville, TN, Dr. Kim C. Norman, tells us the top 4 reasons why dental crowns break and educates us on how to prevent this from happening. Dental crowns can last up to 30 years when properly maintained. Dental crowns fail as a result of bad habits and poor oral care. Here are 4 common reasons why a crown doesn’t last as long as it should. Unnatural Stress – If you are one of those people who frequently bite their fingernails, chew ice and use their teeth as a manipulative device, stop doing these habits right now. These habits place your dental crowns under extreme pressure. Your crown will wear and tear quickly if it is constantly exposed to unnatural stress. Poor Oral Hygiene – Keep in mind that your natural tooth and gums still keep your dental crown in place. It is very important to keep your teeth and gums healthy. A decayed tooth won’t be able to hold a dental crown for long. Once the tooth gives way, so will the crown. Good oral hygiene and dental preventive care are very important to maximize the lifespan of your dental crowns. Bruxism – Teeth grinding or clenching severely stresses your dental crowns. Try clenching your teeth for several seconds and see how it feels. Imagine the pressure this gives your dental crowns when you keep on doing it unconsciously during sleep. Thankfully, the dentist can give you a mouth guard to wear while sleeping. The mouth guard will act as a shield, so your teeth and dental crowns won’t be greatly affected by bruxism. Improper Placement – Dental crowns are customized restorations that need to be carefully placed and bonded over the teeth. 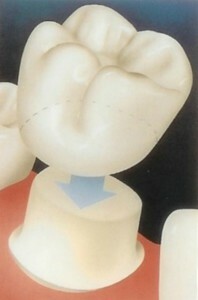 Any wrong move during a crown placement can result to dental crown eventually failing. Thus, it is important to choose a skilled, competent dentist, to perform your dental crowns. Dental crowns are made of very durable materials, yet they can break when exposed to unnatural stress, extreme pressure and unhealthy surroundings. It is a must to practice a good oral hygiene routine, eat the right kind of foods and avoid habits that are bad for the teeth. Brush and floss on a regular basis, take frequent teeth cleanings and visit your dentist regularly. Eat a balanced diet so your bones, gums and teeth receive the right nutrients. Make an effort to maintain good oral hygiene so your dental crowns can last for many years. For quality and well-placed dental crowns in Maryville, TN, schedule an appointment with Dr. Kim C. Norman. He is a highly skilled and experienced dentist. He specializes in all ceramic/porcelain crowns for natural-looking, durable dental crowns. Call us today at (865) 982-9662!